Close-up images from NASA’s New Horizons probe show that space rock has two distinct lobes. It’s a snowman! The latest images from NASA’s fly-by of space rock 2014 MU69 — the most distant world ever visited by humanity — reveal﻿ that it has two asymmetrical lobes. The space agency’s New Horizons spacecraft captured the close-ups of MU69 on 1 January, before it whizzed just 3,500 kilometres above the object’s surface. The rock is a ‘contact binary’, formed by the gentle merger of two objects. Contact binaries consist of two roughly similar-sized objects resting on one another, presumably after coming together very gently. The rubber-duck-shaped comet 67P/Churyumov-Gerasimenko, which the European Space Agency’s Rosetta spacecraft explored between 2014 and 2016, is probably a contact binary. MU69 is 31 kilometres long and 19 kilometres wide at its broadest point. The spot where its two lobes join is marked by a collar of material that is lighter in colour than the rest of the space rock. That might indicate the material there is of a different chemical composition, or a different grain size. Small grains are more reflective than larger ones. Data collected during the fly-by confirm that MU69 is dark reddish, as scientists had suspected. The colour is probably a result of sunlight irradiating its icy surface for billions of years, says team member Carly Howett, a planetary scientist at the Southwest Research Institute in Boulder, Colorado. The brightest parts of its surface reflect about 13% of the Sun’s light, whereas the darkest reflect about 6% — making them as dark as potting soil. So far, the New Horizons team has not spotted any impact craters on MU69’s surface, although those might become apparent in higher-resolution images still being downloaded to Earth, says Jeff Moore, a planetary geologist at NASA’s Ames Research Center in Moffett Field, California. ﻿At nearly 6.5 billion kilometres from Earth, MU69 is scientists’ most distant exploration target in the Kuiper belt, the realm of space rocks that orbit the Sun beyond Neptune. New Horizons visited its first Kuiper belt object, Pluto, in July 2015. But MU69 is special because it hails from an undisturbed part of the Solar System known as the cold classical Kuiper belt. Scientists think that objects there have been in a deep freeze since the Solar System formed, more than 4.5 billion years ago. Data from the MU69 fly-by will give scientists their most direct look at these pristine relics of planetary formation. Its two lobes probably formed as innumerable small particles swirled together and lumped into larger objects, two of which eventually coalesced into what scientists see today, says Moore. “These are the only remaining basic building blocks” of planets, he says. 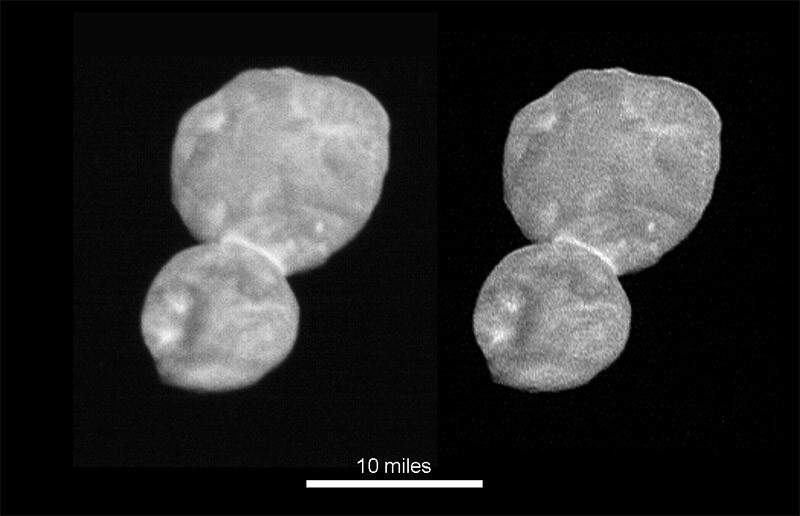 Even as New Horizons scientists celebrated the first close-up images, they also came under fire over the rock’s nickname, Ultima Thule. The team chose it in March 2018, after a public naming contest. Ultima Thule means ‘beyond the known world’ in Latin, and is commonly associated with the Arctic and exploration. But the Nazis also appropriated the phrase to describe the mythological homeland of the Aryan race, as Newsweek pointed out last March. A retweet of that piece on 1 January drew attention to the Nazi associations. Asked about the issue, Alan Stern, the mission’s principal investigator, said that Ultima Thule has been used for centuries to describe far-off lands. “That’s why we chose it,” says Stern, a planetary scientist at the Southwest Research Institute. Like much of the US government, NASA remains shut down while Congress and President Donald Trump battle over federal spending and immigration policy. The Johns Hopkins University Applied Physics Laboratory in Laurel, Maryland, where mission control is based, has taken over releasing the scientific images and data to the public until NASA reopens.